Use TB311W4 to reference this item. My mission is to travel to the peanut capital of the world – Dothan, Alabama. I would like to have my photo taken at the golden peanut cache, Visitors Welcome (GCT2Y5), and with the other peanut statues around town. Feel free to take photos of me with any other lively legumes I encounter along the way. Don’t be a nut! These peanuts are dressed for success, and you should always remember to wear the right safety equipment when biking – especially a good helmet! 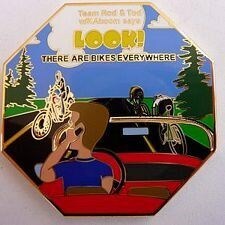 Help raise bike awareness - release a Todie's Wild Ride geocoin!